Whether I'll manage to keep to that schedule is another matter. I expect that I'll need to add in a "touching up" stage for Thursday or Friday. Last night I painted the markings (socks, blazes etc) on the horses. I decided that a couple of them should get stockings instead of socks. This evening I painted the armour and helmets of the riders; tomorrow they will get their cloaks done and maybe the weapons that are in hands (bows, spears). I'm just trying to do a little bit each night, so that they can be finished by the weekend. Wow! Just spotted that I've gained my 50th "Follower". Not bad going considering I started the blog (just) less than a month ago. So, I'd like to take a moment to thank everyone who has become a follower of my blog (I think I've returned the favour for everyone who has a blog - if not, let me know). I hope you'll continue to enjoy my posts, eye candy and ramblings for a long time to come. Haha! That threw you didn't it! Pics at the start of the post rather than after my blatherings. In between chores, I got a bit more done on the "other cavalry" - manes; tails; dark muzzles and cannons* where appropriate; light socks on the palaminos; plus the leather-ware (cruppers, girths, reins, bridles). The metal-ware and colourful bits will be done alongside painting the riders. Later on I'll add white markings to those horses that might have them. The one thing I have realised is that I've almost certainly been working in the wrong order on these figures. With the riders affixed, it would have made much more sense to do them first and the horses afterwards. I'll try to remember that for my next batch. I'm pretty sure that I'll have these 48 figures finished to the point of being on textured bases by next weekend. 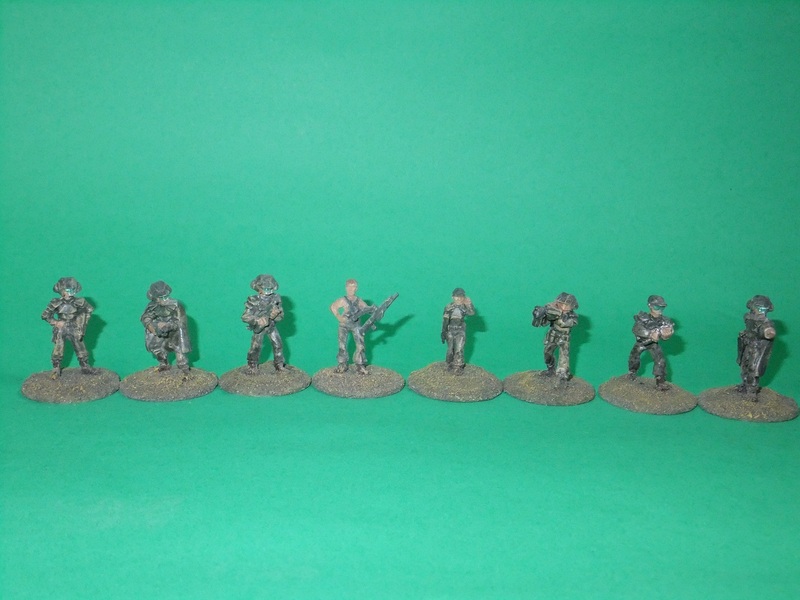 Then it's a quick dash to paint up some infantry (bow and javelin light foot); my commanders and the camp. 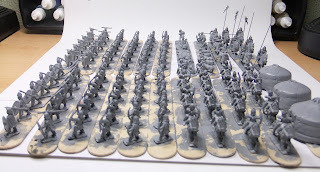 That will give me an army I can use in the club competition - any other units I complete can be used to vary that army. Test Lab Update: Having left the command lancer figures overnight, I tested the "B" figure by applying some brown-wash. The red ink did re-dilute a little in patches, but not too badly. The effect is quite good, although the down-time between applying the ink-dilutions and doing further work may not always be practicable. 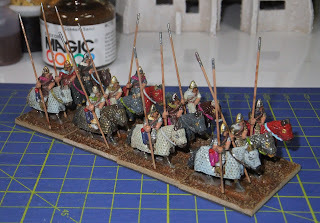 You may have spotted in my post yesterday that I've had a brilliant (or possibly very silly) idea about how to paint coloured horn-scale armour and barding. 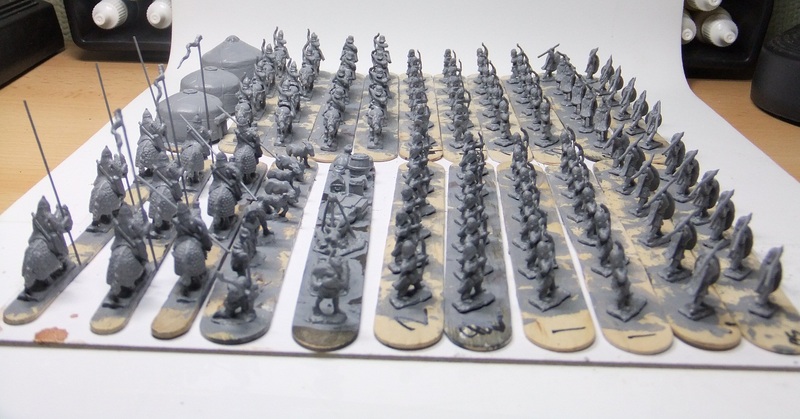 Well, I realised today that in among the 48 "other cavalry" I'm currently working on there are 9 horses with barding. "What the heck" I thought "let's try out that idea on them". The barding was given a thin basecoat of Green Brown, allowed to dry, ink-washed (5 different colours used), allowed to dry, then given a second ink-wash (using the same colours). From a distance it looks quite effective, but close up you see that the colouring has settled into the recesses with very little staining of the raised scales. Hmmm, that idea didn't work out then. 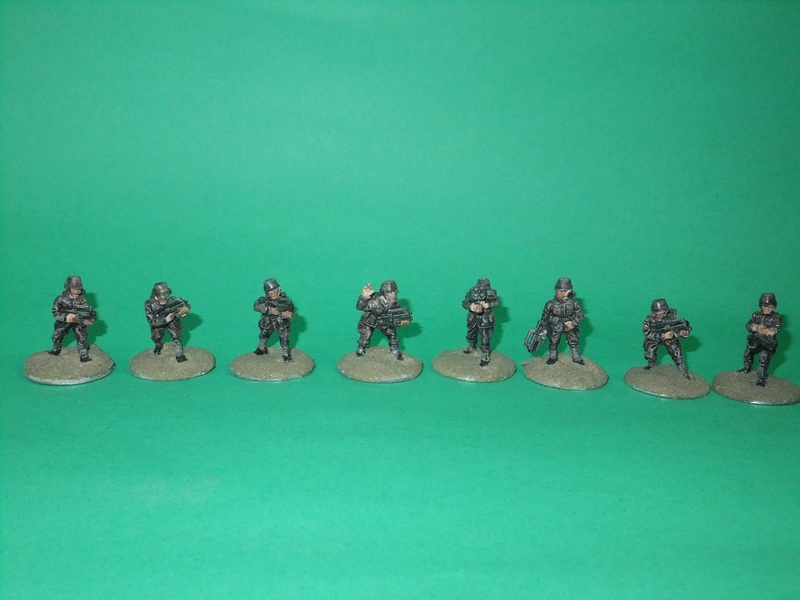 Looking around my bench, I spotted my painting sticks for the command groups. I figured that 3 of the lancer figures from there could be sacrificed to the gods of experimentation. The brown wash over the ink-dilution (C) may have been a mistake - it seemed to re-dilute and mix with the ink. It might be that the ink hadn't dried sufficiently, or it could be that it will happen regardless of how long the ink is given to dry. Overall, the best effect seems to be with (B). I'll give it some extra time to dry (overnight) and then tomorrow I'll test a small patch with the brown wash to see if the ink runs again. ZOMG! Busy day on my blog! What can I say? I guess there's only one thing that can be said - "Thank you ever so much Armand for bigging me up on TMP!" For those that aren't regular TMP readers, Armand (aka Tango01) regularly scans blogs, wargames sites and various other sources on the web for eye candy which he posts up on TMP. Last night he found and posted this pic of my Sarmatian lancers in this TMP thread. Since then I've had almost 400 hits to my blog and gained a few new followers. I didn't feel like doing any proper painting this evening (NB - nothing to do with my new found fame) so I just did some simple jobs - "whitewashing" some figures and bits (the light horse, command groups plus the camp followers and paraphernalia) which I've just given a brown ink-wash to bring out the details before the painting. If you've read my posts in Armand's thread on TMP you'll see I've had an idea about how to do the painted horn-scale barding on horses better - grey/brown basecoat followed by a colour ink-wash. I'll have to try that at some point, maybe when I do the rest of the armoured lancers. thinking about it, it's basically the same method that I'm using for the horse colouring, but more colourful. Sorry - no pics today! I managed to make a pretty good start on the "Other Cavalry" this evening - all 48 horses have received their basecoat and their washes. At this point, I must admit that some look better than others - hopefully the end stage washes will bring them together more. Manes, tails, markings and horse-tack are on the cards for tomorrow. **I really don't think this one worked - I'll probably go over these with the other 3 washes.if I still don't like the effect in a couple of days time. Given how much I'd been dreading the prospect of painting horses, I am pleased to report that they aren't nearly as bad to do as I'd been led to believe. That may well be due to the method I'm using, nicked from Simon MacDowall's website. Well, as I haven't posted pics for the last couple of days I made sure to take some this evening for your delectation and salivation. So, either read through my ramblings first or skip straight down to JPG goodies. I guess I should have realised something was up last night - I'd dozed off while watching TV at one point and had some trouble getting to sleep. Well, when I woke up this morning my sinuses were clogged, my throat was rough as ****, my body didn't want to move and I was feeling wiped out. Yup - I've got a heavy cold. After taking some cold medicine and having a hot drink I crawled back into bed for a couple of hours. Anyway, that's more than enough verbiage from me - here's the piccies! The bad boys above are next up for painting - aaaahhhh! Horses! Lots of them!! 3 BGs Armoured Lancers - spotted I'd forgotten to paint the bases before gluing the figures on (D'Oh!!) so I did this. Glued archers and javelin/spear foot onto sticks for painting. these will be gesso primed tomorrow. 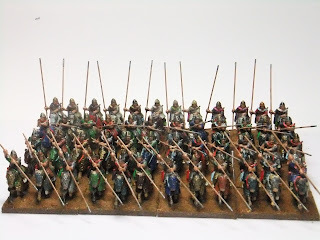 Having assessed my army lists for the club tournament, realised I could probably use more LF-Javelin troops against Gordon's Classical Indian army which will have plenty of hephalumps, so I placed an order for some more from Donnington along with enough mounted bowmen and lancers to make up 2 more BGs of "Other Cavalry"
I've also realised that I need to order some more cavalry bases, so I'll probably do that tomorrow. Current Armoured Lancers (3 BGs) - these were gloss varnished when I got home from work. 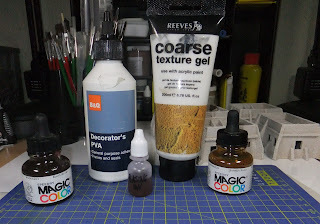 I would have done the basing, but looked and realised that last night's brown wash didn't seem to have settled into the recesses or stain very much, so I made up a mix of Klear and brown ink and gave them a wash with this. Basing will be done tomorrow night. Armoured Lancers I finished painting a couple of weeks ago - I spotted that the basing texture was actually a bit thin, so I mixed up some more and added this to the bases. Currently drying - will give a dark wash and then dry brush tomorrow. 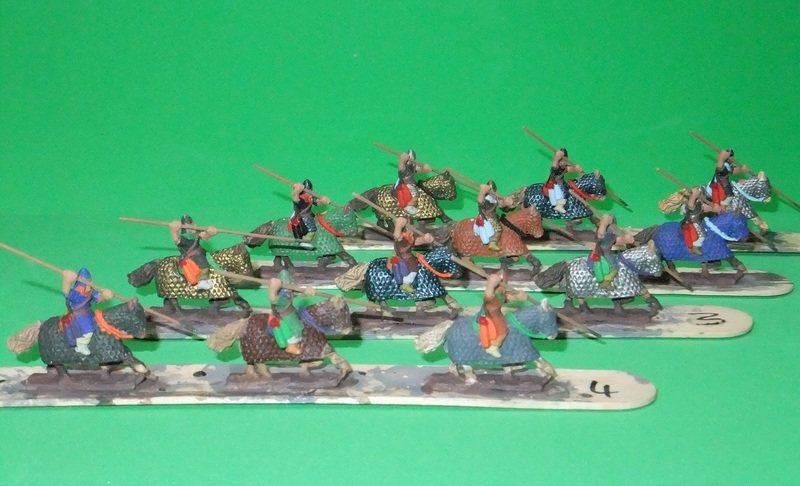 "Other Cavalry" - these have been given a brown wash now over last night's "white-wash". I wasn't sure how necessary this step was, but now the wash has dried I can see that it has definitely helped to pick out the detail for when I do the main painting of them. Edit: Klear dries hard really quickly! The armoured lancers are now off the sticks and glued onto their bases. Texture mix will be added tomorrow. Well, I did get a bit more done on the armoured lancers, although not as much as I'd hoped (I got up late and had some chores to do). Touch up, detailing and brown-wash are done. Gloss varnish and basing will have to wait until tomorrow. 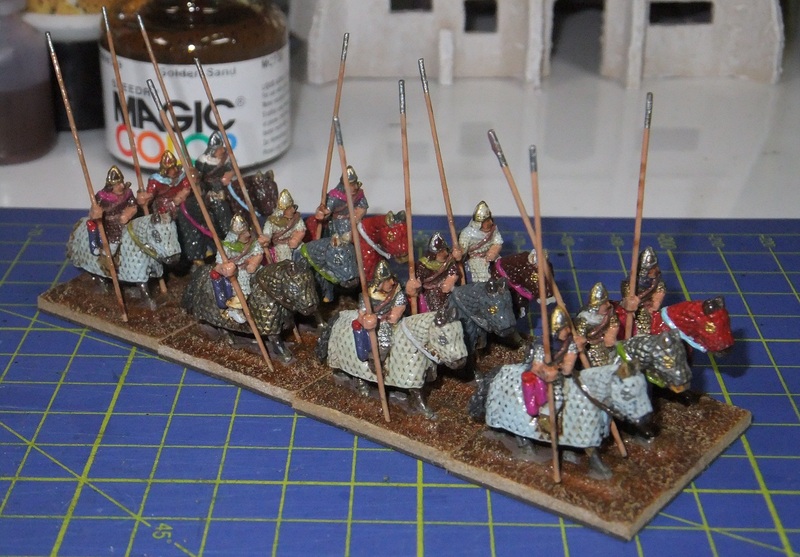 While I was letting the paint dry before doing the wash step, I did do a bit of prep-work on the "other cavalry" (Bow*/Light Spear cavalry). As the vast majority (39 out of 48) of these are mounted on horses without barding, it means I'll actually have to do decent horse painting. 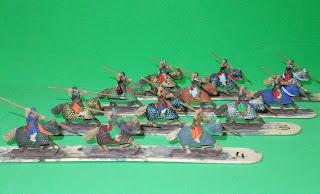 I've decided that I'll try to base it off the technique shown on Simon MacDowall's website but with the riders attached (I'll work around them). 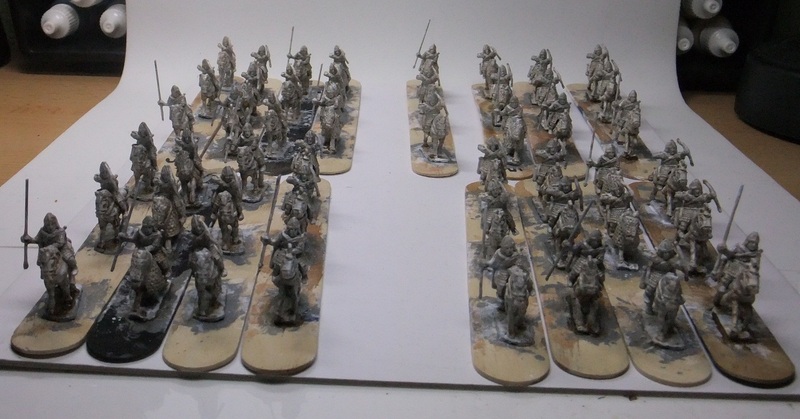 So, all of the horses and riders have received a thin coating of white over the grey gesso primer and will get a quick brown-wash tomorrow while I wait for the gloss varnish on the lancers to dry. I think I've finally found the right lighting set up and camera settings!!!!!! Just need to do some detailing and touch-ups tomorrow, followed by wash and gloss varnish, then if it isn't too late I'll base them up. Later on I'll be doing the faces and arms of the riders; second shading on the horses; hooves; ground colour. I think tomorrow will see these finished - that will be the detailing, touch-ups, brown-ink super- wash and gloss varnishing. 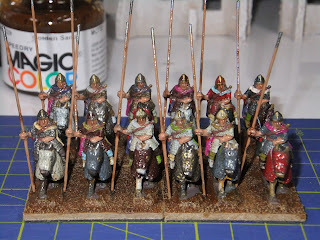 If the varnish has dried in time, I might even get to do the basing - if I do, then you'll get pics. Given that my left arm seems to be recovering, I'm planning to try resuming painting tomorrow or Saturday. I'll be using a padded keyboard wrist-rest to provide a cushion for my elbows while painting and doing shorter bursts with longer breaks. After reading various threads on TMP about using various items as a source of cheap buildings for SF, I've bought a couple of bits to give this a go myself when the weather gets a bit warmer - they'll need spray painting and at the moment I don't want to be opening the windows for ventilation as it takes my central heating positively ages to warm my flat up again. I could do the spraying in the morning before I go to work I guess, but waiting would give me some time to buy various fittings to accessorise them - windows, doors, vents, a/c units etc. C) Just an annoying scumbag? "Eh? what's all this about then?" Perhaps I should explain. I live in a top floor flat of a house built as 6 flats, the upper floors sharing a stairway and front door with letter box. Back in December, I was heading out to do some shopping on a Saturday morning just as the post was being delivered. I quickly sorted through it, separating it out by flat and placing each flat's post on a separate step. there wre three items for me, one of which was my subscription copy of Wargames Illustrated. When I got back from my shopping trip just over an hour later, the Wargems Illustrated had disappeared. I gave it a couple of days in case a neighbour had picked it up by mistake and returned it, but they never did so I ended up buying a copy from a newsagent near where I work. It now appears that my subscription copy of the current issue of Miniature Wargames has disappeared - I should have received it last week, but no sign of it so far. I should note that all of my neighbours in the upper flats are from overseas and from the brief conversations I've had with some of them don't speak much English (it's quite possible that other members of their households do speak reasonable English, just not the ones I've spoken to). I should also note that as far as I can make out it is only these two magazines that have miraculously vanished. So, do I have a secret wargamer, an anti-wargamer or just an annoying scumbag among my neighbours? Did you think I was joking? TS-GARP was the dominant governing body until recently, with all but a handful of known populated systems being members. Those that weren't members were generally inhospitable, low population or had limited exploitable resources. TS-GARP was first established over 2 millenia ago, increasing in size and complexity as new systems came under its control. However, over time its original ideals fell away as corruption, inefficiency, incompetence, procrastination and remoteness from the subject populations grew (along with the economic burdens placed on them through taxation and the bribes necessary to conduct any form of trade). Government was by a Congress of representatives from each member system - over time these became dynastic and aristocratic, interested only in representing their own interests rather than those of the people in their systems. Free trade between systems had largely broken down as a result of the high taxes and the bribes to politicians and th merchant guilds needed to transport goods from one system to another. Unrest had led to rebellion in some systems, to which TS-GARP reacted with uncharacteristic alacrity to brutally suppress with maximum force, largely due to responses of some of the regional governors they had appointed. This unsettled a large number of senior military officers, many senior administrators and a small number of politicians and merchants. It also led to growing unrest in previously non-rebellious systems. The network of those in senior positions who had grown disturbed by what was occurring in TS-GARP were finally in a position to act, and did so with surprising speed and focus. Congress was overthrown in a matter of days and FEW was established. There was much rejoicing among the systems previously ruled by the aristocratic and merchant elites, particularly when their attempted counter-coup failed abysmally and many were killed. After 5 years, most of the former TS-GARP worlds are now members of FEW although their are still pockets of systems still under the thumb of their aristocratic elites. Some formerly independent systems have now joined FEW. FEW has been able to reduce interstellar taxation, reducing the burden on ordinary citizens, and has acted to stamp out the bribery expected by the merchant guilds thereby freeing up interstellar trade once more. A new Congress has been called, tasked with agreeing a new constitution and system of governance for FEW. In the interim, former Governor Mas Sajing has been appointed Emperor for a term of 5 years. The military almost entirely pledged its loyalty to FEW, although some fleets and garrisons defected to the systems still controlled by TS-GARP. The aristocratic elites have not given up their belief that they have an absolute right to govern the galaxy, and have been building up their own military on the planets they still control and trying to forment sedition in systems controlled by FEW. Acts of sabotage are common, committed by cells of TS-GARP troops rather than inhabitants of FEW systems. They have also committed numerous terrorist acts against civiilian targets. The elite troops of the reconfigured FEW army, easily recognisable by their white armour. the Empirical Tempest Commandos are specially trained in counter insurgency operations, and selected for their ability to work with local populations. Promotion is based entirely on merit - all NCOs and officers are selected for training from the ordinary ranks. The Bo'Dyar T'Ette system is one of the new members of FEW, having refused to join TS-GARP. This resulted in a large but unsuccessful attack by TS-GARP forces, leading FEW to provide a small protective military presence in the system, consisting of a battalion of Empirical Tempest Commandos and a small naval patrol group (2 light cruisers, 2 destroyers, 2 frigates, 2 sensor pickets, 3 corvettes and 3 couriers). Having been independent of TS-GARP, but in a location near to major systems, Bo'Dyar T'Ette became a favoured system of smugglers, pirates, outlaws, free traders and those simply seeking to escape from the corruption and oppression of TS-GARP. There is 1 minor habitable planet in the system, and 1 minor and 1 larger planet which are habitable after a fashion. Terrain Description: Largely forested with some mountain ranges, seas and lakes. Some grasslands. Human Population: some small survey parties and trading outposts. Possible site of bases for some criminal groups and TS-GARP cells. Climate: mostly hot, dry, arid, barely habitable but with areas where habitation is possible toward the cooler poles. Terrain Description: largely dry desert; arid grasslands; some mountain ranges and rocky wastelands. Some small bodies of water in the polar regions. Intelligent Native Species: 2 intelligent species known, the A'Waj and the Ne'Skut. Populations unknown. Human Population: around 200-300,000, mostly in the polar regions. 2 starports, 1 in each polar region. Human Population: some small survey parties, mining and ice cutting teams. Possible site of bases for some criminal groups and TS-GARP cells. So, where do I take it from here? I still haven't decided whether this will be used for a solo-campaign or as a setting to use with other SF players from my club. It may even go as a combination of the two. It will certainly be a while before I can bring it to life - figures, vehicles and terrain will all need to be sourced and made ready. I know what figures I'll be using for all bu the Ne'Skut - might need to do some head-swaps for them. Now, how do I work my Khurasan Space Demons into this setting?????? OK, so I haven't posted since Tuesday. Well, there's not been anything really worth posting about, what with me not being able to do any painting. Resting my left arm and avoiding bending the elbow too much seems to be helping - I've been getting some sensitivity back in the fingers that were numb and I can bend my elbow without causing any discomfort. I'll still give it another week of rest before trying to paint again. The draw has taken place for our club's FoG B4BC tournament, so I know who my opponents will be. I've been drawn against Seb (fielding a Chinese army), Gordon (fielding a classical Indian army) and Tim "Madaxeman" (army undeclared so far). 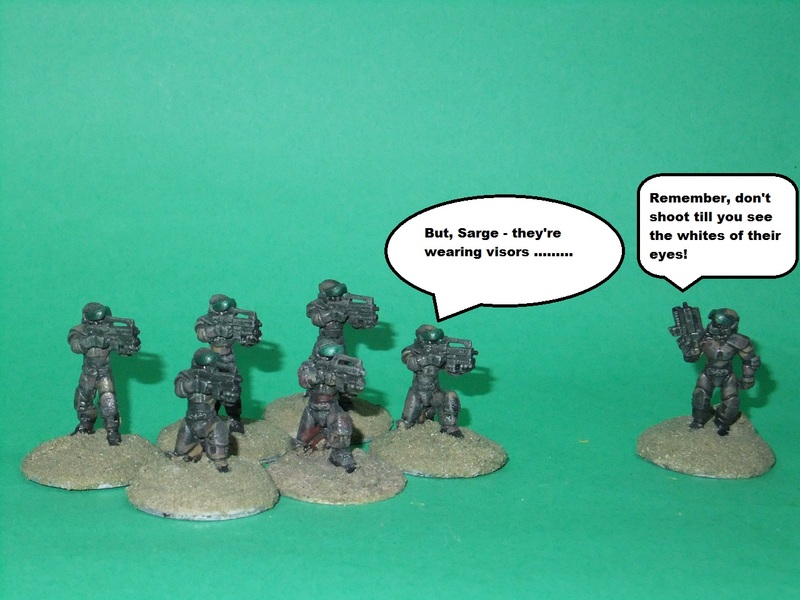 It should be interesting to see how my Sarmatians do against them, particularly as I'm pretty new to FoG. "Well, that's all very good, but what have you been up to for the last few days?" I hear you cry. Not very much on the wargames-related front I'm afraid. What I have been doing is thinking about paint schemes for my SF fleets and figures when I'm back in painting mode, what figures/vehicles/gear I need to complete various units and whether or not I should do a small solo SF campaign to post tales of on here (if you're really unlucky, I'll post my current thoughts - including background fluff - tomorrow). IJSN: light grey base; white or white-grey structural blocks; red (probably vermillion) for raised panels; detailing colours undecided, but leaning toward gold for some things. I'll need to do some test ships to see how these look. 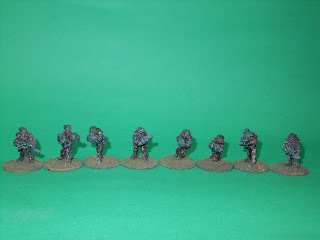 In the meantime, just to keep those of you salivating for pics of minis happy, here are a couple of pics of the Sarmatian light foot from Strategia et Tactica that I painted a couple of months back. For the archers, I may well go back and repaint the bows to a lacquered-wood/horn colour - brightly painted bows doesn't look quite right! Overall, I was reasonably happy withthe Strategia et Tactica figures that I bought, although a few had faces that made me think they may have been sculpted by Bosch or Munch (or seen their paintings!). Sadly, it seems that they have stopped trading. As I was on the way out to go to work this morning I found a packet on the stairs - my order from Khurasan had finally arrived. I guess it got delayed during the Christmas period. So, what was in the package? 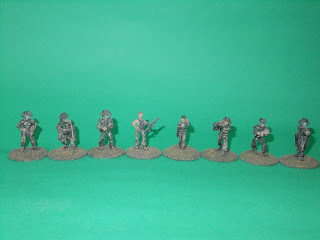 On quick inspection the figures are all very well cast with very little flash. 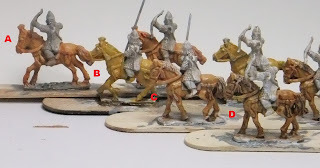 I'm looking forward to getting these painted up once I've done the Sarmatians. In the meantime, they'll be going into my lead-pile. (OK - the Space Demons might be paintable before my elbow is healed: spray-prime, metallic spray base coat, Klear/ink wash and some detailing could be possible without having to bend my left elbow too much). And now for the AARs. Between 4 of us we played 3 games of Tomorrow's War last night at CLWC. Sorry there aren't any pics - I did take my camera, but forgot to take any. These AARs might not be 100% accurate, as I didn't make any notes as we were playing, but they should be pretty close to what happened last night. This was a patrol encounter in rolling countryside with a lot of scrub cover around a road/track. Mike had 1 squad of 7 Gretchin, 3 squads of 7 Orks, a scout car with 2 Ork and 2 Gretchin crew and a 3-Ork command team. My force consisted of 3 six-man squads (each with 3 squad support weapons - 1 x AP2 SAW, 1 x AP2/AT2 RPG, 1 x AP2/AT2 Plasma gun) and a six-man command/weapons team (with 2 support weapons - 1 x AP2/AT2 plasma gun and 1 x AP3:AT2 rapid plasma gun). Pre-game we'd agreed that my NSL would be TL3, D10 quality/D12 Morale against Mike's TL2 Orks (hmmm, not so sure they'd be that high tech). We also agreed that the Orks would have a base D8 for TQ/Morale increasing to D10 if the "Boss" was in LOS. Mike would have initiative for Turn 1, my force would start anywhere within 12" of the centre of the table. Mikes' first activation saw his scout car advance along the road, where it was attacked by the nearest NSL squad with their plasma gun and RPG. The RPG shot whizzed over the top of the vehicle, but the plasma gun hit with both dice, immobilising the scout car and taking out half its firepower. The return fire saw two hits on my NSL squad, but they were easily beaten by my defence rolls. the vehicle crew, realising that they were a sitting target, bailed out only to be fired on by 2 of my squads, resulting in 3 casualties. 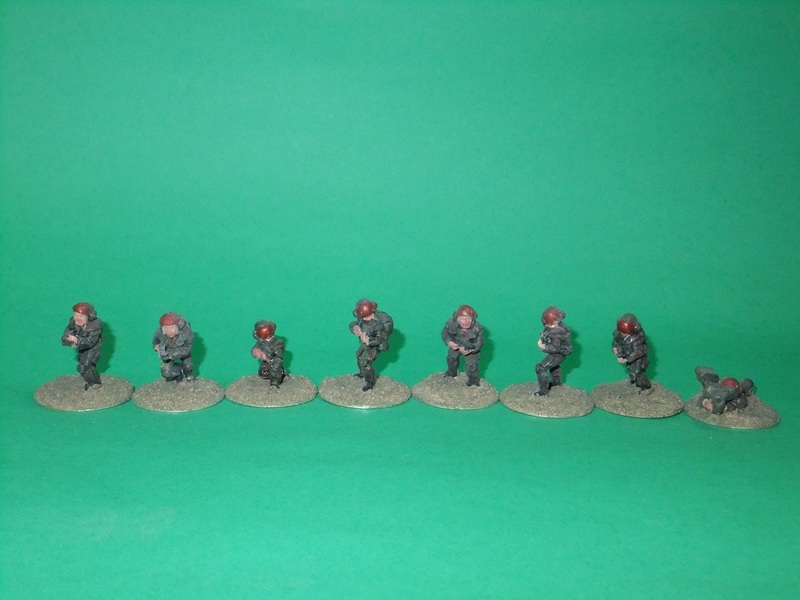 I then moved the two squads furthest back forward to positions where they would be able to engage the enemy. Mike then brought on the reaming squads of Orks, who were rapidly decimated by my reaction fire, their return fire was totally ineffective. Turn 2 saw me winning the initiative. The Command/HW team went on Overwatch, the 2 squads nearest the Orks opened fire causing even more casualties. The presence of the Boss in LOS for most of them caused an improvement to their return fire and 1 of my squads took 2 casualties. The Overwatch team were very effective, winning most of their interrupts and wiping out even more Orks. Mike's remainign Orks were intending to charge, but either failed their tests and were unable to or they got knocked out by defensive fire as they rushed forward. At this point we decided to call an end to the game. During a brief post-game debrief, we realised we'd played a couple of the rules wrong, and had forgotten a couple of tests that should have been made, but who care? We had fun for an hour or so. Turn 1 saw Slim's marines come onto the table, unopposed. Straight to Turn 2, Slim retained the initiative. One squad advanced to the river bank and tried - but failed - to spot the nearby DPRG team, who proceeded to launch their ambush. Unfortunately, the rush to put conscripts into the filed had led to a lack of proper weapons training and their fire was ineffective - the return fire from the marines caused 2 casualties. 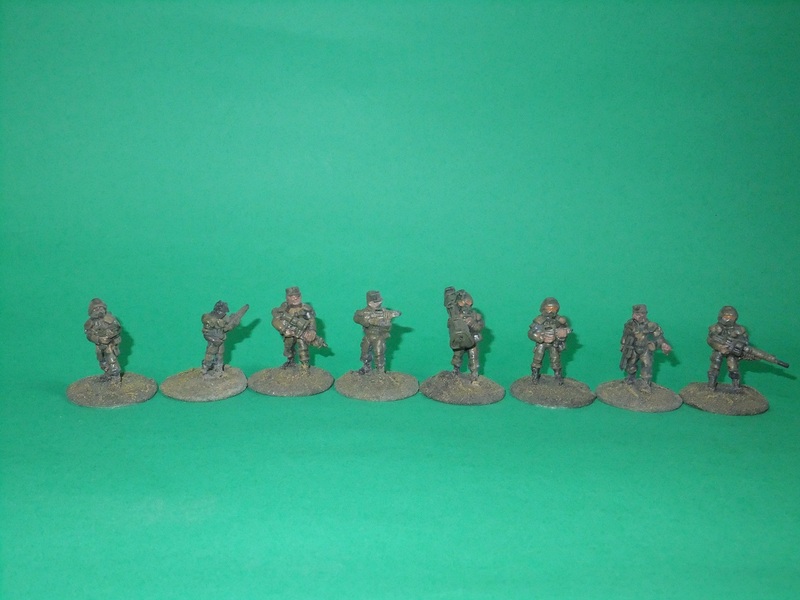 Our command team also reacted from ambush to fire on the marines, equally ineffectively. The marines return was again effective, causing 4 casualties. Dicing to see if any of the "specials" had been hit, the squad leader was down. He obviously wasn't well loved by his troops as their morale test was successful and they were quite happy to carry on. Slim moved the remaining squads up, taking more ineffective fire from the DPRG and causing a couple more casualties. I then moved the 2 DPRG teams that hadn't activated, bringing one up closest to the hut where the downed airman was sheltering and the other moving forward to get a good LOS to the river crossing. Turn 3: Mike and I (somehow) won the initiative. Doing the first aid checks, saw 3 kills, but the hated Squad Leader had survived with a serious wound. The command team went on overwatch; the team close to the hut arrived there but Slim had LOS to them and reacted with fire from one of his teams - our command team successfully interrupted, but failed to cause any casualties; the marines' return fire caused 2 casualties. Dicing to see who was hit, the Squad Leader was down again! The team failed it's morale check and was pinned.We then resolved the reaction by the marines to the team moving to the hut - the marines won but failed to didn't score any hits, the DPRG's return fore also didn't cause any casualties. Our team by the river, nearest to the marines opened fie, but the marines reacted and got their shots in first, reducing the team to 1 man active who failed his morale check and was pinned. Slim then moved one of his teams to the bridge where a pointless exchange of fire occurred and his third team over the bridge. None of my teams had LOS to them, so couldn't react and that ended Turn 3. Turn 4 saw Slim regain the advantage. Doing first aid tests resulted in the Squad Leader gaining a second serious wound. Some guys just don't know when to stay down. The DPRG saw a couple more deaths. Slim put 2 teams on overwatch, and moved the team that had crossed the river up to the hut. My command team and the team by the hut both reacted with fire, but lost their reaction tests and also lost their tests against the interruptions by Slim's teams on overwatch. The command team somehow only took 1 hit - neither Mike nor myself wanted to roll the dice to see who the casualty was, so we allowed Slim to roll after all joking that it was bound to be the Squad Leader. Slim rolled, and guess what? It WAS the Squad Leader. The die roll couldn't have been timed better - just as it landed on a "1" there must have been a goal in the football match that was being shown in the main bar as there was a huge roar of applause. The rest of the turn went pretty much as expected - DPRG fire totally useless against the marines, the marines' fire devastatingly effective against the DPRG. Turn 5 and first aid checks - the dauntless Squad Leader got a third serious wound. He must be a descendent of this guy!!! Turn 6 was even more of the same, with 1 really bad Fog of War card for the DPRG - they set off a hidden booby trap/mine. Guess which team took the hits? Yup, the command team. Guess who was the only casualty? Yup, the Squad Leader. Slim's marines managed to collect the downed pilot from the hut and the turn ended. Turn 7: we did the first aid checks, just to see if the ultimate survivor had actually been killed - a light wound to add to his 3 serious wounds. Our remaining DPRG troops, realising that their numbers were rapidly dwindling decided that desertion was the better part of cowardice, and bugged out to the back-country allowing the marines to get away having successfully completed their mission. This game proceeded pretty much the same as the last one until near to the end, one exception being the Squad Leader actually getting killed. During Turn 5 (I think) Slim rolled a 1 during a reaction test and went "Whoopee!" (or words to that effect when he read the Fog of War card he'd drawn as he thought he'd gained a D10 quality sniper team. That was until I read the card and pointed out that it said "Your opponent has a sniper team......". The snipers managed to score hits on the remaining DPRG on the hut side of the river, leaving them with a single team (down to 4 men from earlier fire) on the other side of the river, who decided that bugging out was the best option in the circumstances. All in all, 3 fun games, and it's had the result of persuading Seb to have his 15mm SF figures brought over when his parents visit him in a week or two. I think that it does help (at least with players who aren't familiar with the rules) to have a third person assisting who can look things up as and when needed, especially as the rule book isn't as well organised as it could be. Well, here's my congrats to the captain and crew of good old Dropship Horizon - 1,000 blog posts in about 3 years. Dropship Horizon has been - and indeed still is - an amazing and invaluable resource for 15mm SF gamers and collectors and is one of my daily "must-reads". Looking forward very much to seeing this blog continue and reaching 2,000 posts. Went to the docs this morning to find out about the weirdness with my left arm. As I suspected, it seems that the ulnar nerve is trapped/pinched/compressed, probably at the Cubital Tunnel in the elbow. So, what does this mean? For starters I'll have to put painting on hold for a week or two as I need to rest that arm and try to avoid bending it at the elbow. I also have to try keeping the arm straight while asleep by wrapping a towel around the elbow. If rest doesn't sort it out in a week or so, then it might need further investigation and possibly surgery to shift the nerve to the inside of the elbow (even more time away from painting minis). Assuming that resting for a couple of weeks sorts it out, then I'll need to make some adjustments - I've already bought a keyboard wrist-rest which should provide a good cushion for my elbow when painting. 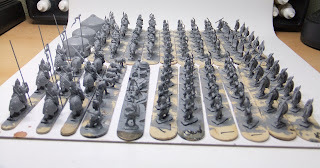 I guess I'll just have to base up my unpainted Sarmatians to use during my club FoG tournament as the chances are that they won't be finished before my first game. I won't be doing any painting tomorrow - first trip ofthe year to CLWC for me. I have a couple of games of Tomorrow's War lined up and will try to get some pics and do AARs tomorrow or on Tuesday. Foreground L to R: the Sarmatians, armoured lancers on front board, "other cavalry" on rear board; my painting surface - a sheet of 3mm acrylic; a small sorter box with the paints I'm using for the Sarmatians. I made a fair bit of progress today on the next 3 battle groups of Armoured Lancers. 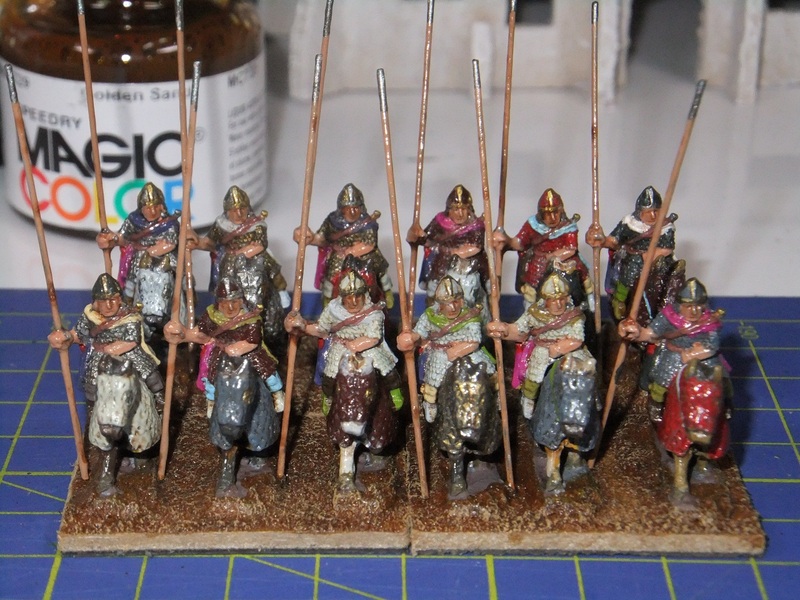 The main blocks of colour - horse barding, armour and cloaks are done on all 36. 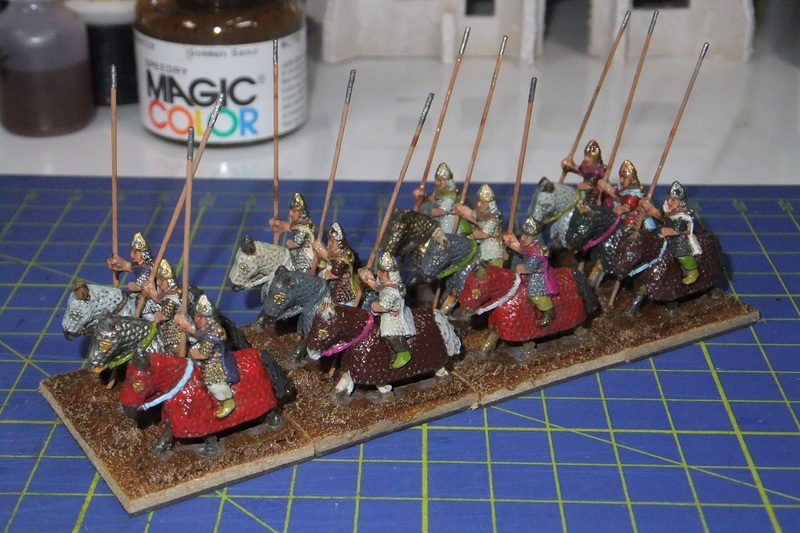 This leaves the horses and detailing on the riders, which I should hopefully be able to get done tomorrow. If I'm lucky, I might even get to the point where they're washed and varnished. 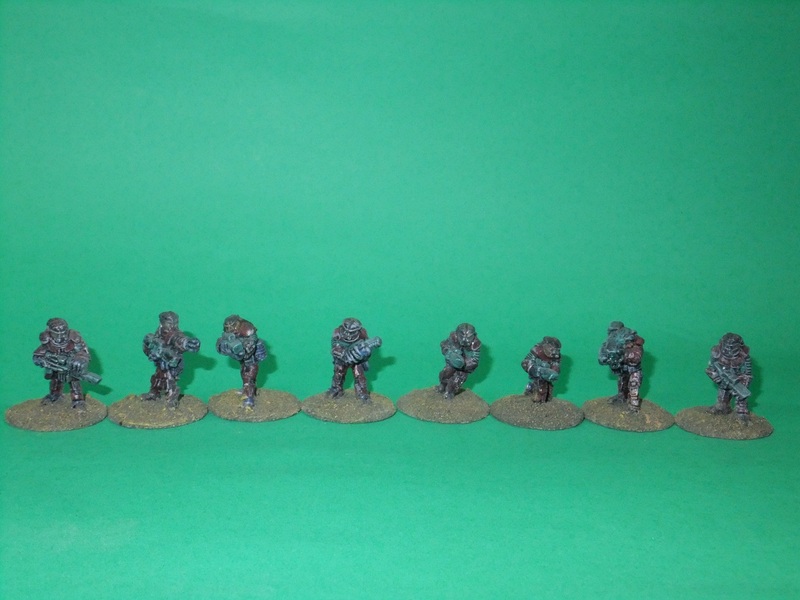 The first Sarmatians off the painting line! 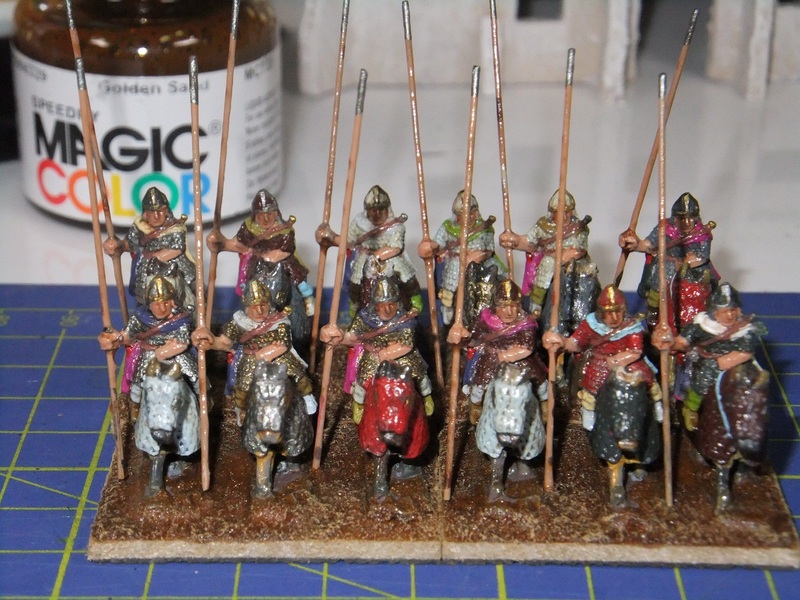 Well, I managed to get a bit further along than expected with the first battle group of Sarmatian lancers - they're based and the ground texture has been drybrushed. Tomorrow they'll get a quick coat of PVA over the texture and have some small rocks and tufts of flock/foliage added before getting a spray of matt varnish. They've come out quite well, but I'm not happy with a few of the colours (the red and magenta are too bright and the pastel blue and green are just, well, a bit bleugh) so those are being dropped and some other colours added to the mix for the rest of the army. Left to Right: Earth Brown ink, PVA glue, ink mix, Reeves Coarse Texture Gel, Golden Sand ink. the ink mix in the dropper bottle is 3 parts Golden Sand to 1 part Earth Brown. These are from The Scene and are the ones I painted up the other night. I've got some silver and tinted PVC sheets which I'll use to make window panes. then I'll just have to get some suitable doors and fittings (a/c units and such like) to finish them off. I didn't get anything done on the Sarmatians yesterday, but that doesn't mean I was slacking. I did make up new batches of "wash base" and flow aid, as well as a slightly weaker batch of black wash. After that I finally got round to repainting some adobe/desert dwellings from The Scene - paints used were B&Q "Cappucino" matt emulsion, drybrushed with two gradually lighter mixes of Cappucino with Reeves white craft acrylic. 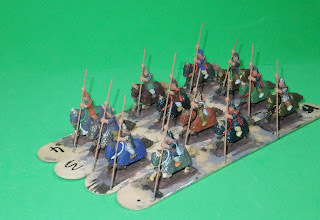 Finally, I sorted out the different paints I'd be using for various bits of the Sarmatians (why did I have to go and pick an irregular army? Sooooo many different colours. 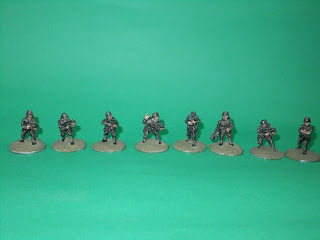 Next time I'll go for a more uniformed army, like the Romans). Today I actually made a start on painting my first battle group of armoured lancers. I've got about 2/3 of the way through - just some belts, skin and horse ears, tails, lower legs and muzzles to do, followed by a wash after doing any touch-ups needed. Hopefully they'll be done in time for me to get some pre-basing pics taken to post here tomorrow night. I was trying out a wet palette I'd bought, but it seems to dry out very quickly - I might need to put more of the blotting paper layers in next time. Looking at what I've done today, I think I may change the process for the rest of the army, by reducing the number of colours used and by doing several battle groups at a time. Oh well, we live and learn. 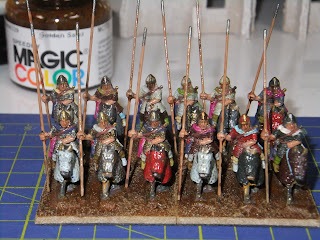 Looking at the Sarmatians I ink-washed yesterday, the wash seems to have stained the gesso primer rather than settling nicely into the recesses. I tried another wash-mix (higher matte medium percentage) and that went on like paint! I guess that gesso must have more "tooth" than the primers I've used before. The detail is pretty clear anyway, so the initial wash is probably unnecessary. Note to self: skip the post-priming wash step! Black ink wash applied to the Armoured Lancers I primed yesterday. I think the wash may have been too dilute as it doesn't seem to have picked out the details very well. I'll take another look in the morning and then decide if I need to do make up a stronger wash.
And some more pics - 25mm GZG figures again, to show my complete collection of these. 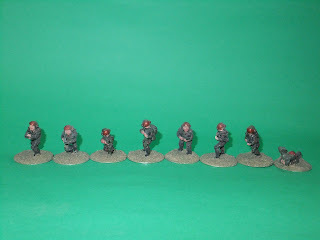 I'll try to take some pics of my 15mm Sci Fi tomorrow if I have time.